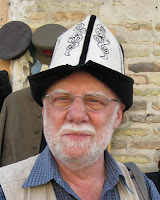 Dr Ken Parry, who travelled with Uzbek Journeys in 2012, is Senior Research Fellow in the Department of Ancient History at Macquarie University, Sydney. He researches and publishers in the fields of Byzantine history and Eastern Christianity and has travelled extensively in Central Asia and China. Most of us do not associate Christianity with Central Asia, especially not early Christianity, and yet Eastern-rite Christian communities were established in the region by the 5th century AD. The Church of the East had a bishop at Merv and a metropolitan at Samarkand by the mid 6th century, and there were communities at Kashgar and Turfan in Chinese Central Asia (Xinjiang) by the 7th century. 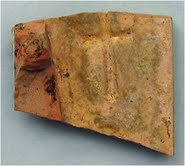 Most remarkably we have evidence for Christians in China at the Tang capital of Xian by 635. We know this date from the discovery of a stele with an inscription written in Chinese and Syriac discovered in the 17th century. However, most of the archaeological evidence for the Christian presence in Central Asia was unknown before the early 20th century. It was largely as a result of the explorations by Western scholars such as Aurel Stein, Paul Pelliot and Albert von Le Coq that this evidence came to light. Since then many more finds have been made. But who were these Christians? Initially they came from Persia where we know there were Christian communities from at least the 3rd century. It was mainly as a result of the international trade on the Silk Road that Christians established themselves in the oasis towns of Central Asia. The Church of the East used Syriac as a liturgical language, but the discovery of textual fragments at Turfan shows that they also used local languages, such as Sogdian and Uighur. Sogdiana was the ancient name given to the region that covers much of Uzbekistan today. An important witness to Christians in Sogdiana was the Muslim scholar al-Biruni (973-1048) who was born near Urgench, and who provides first hand information about the Christian communities. Before the dominance of Islam, Christians lived alongside Buddhists, Zoroastrians and Manichaeans in many towns in Central Asia, where they formed part of the melting pot of ethnic groups and religious cultures. Among the artefacts relating to early Christianity in Uzbekistan are several ossuaries found in the region of Samarkand, as well as the site of a monastery at Urgut, also near Samarkand. Further archaeological finds at Qarshovul Tepe near Tashkent would seem to indicate the presence of a Christian community. While many of the earlier finds can be seen in London, Berlin and Paris, visitors to Turfan in Xinjiang can see several sites associated with these discoveries. 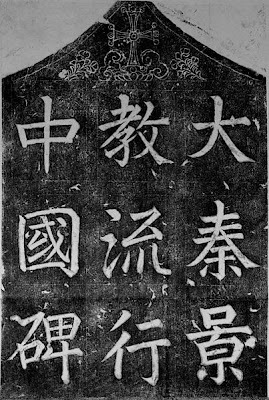 In Xian the stele with the bilingual inscription is on display in the Forest of Steles Museum. The stele was erected in 781 and shows the cross on the lotus flower. If you want to hear more about Early Christianity in Central Asia Ken will be speaking on this topic at the Powerhouse Museum in Sydney on Saturday 7 September 2013. A symposium is being convened by The Asian Arts Society of Australia and the Macquarie Asian Historical Research Society.